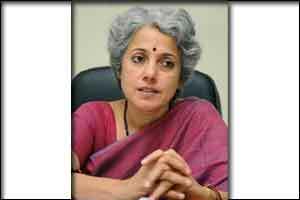 New Delhi: ICMR chief Soumya Swaminathan, a globally recognized researcher on tuberculosis and HIV, is set to assume the charge of deputy director-general of the WHO in Geneva next month. Her appointment as the Deputy Director-General for Programmes (DDP), announced early last month by the World Health Organisation, elevates India’s stature globally. It is the second-highest position in the WHO. “The plan was to join WHO on December 1 but I am still waiting to be relieved from my current position. So, sometime next month I will take charge as the DDP,” she told . Swaminathan, a pediatrician by training, is a daughter of agriculture scientist M S Swaminathan who is hailed as the father of the ‘Green Revolution’. As she moves from her current position of the director- general of the Indian Council of Medical Research (ICMR) to a global health arena, Swaminathan hopes that her stint at the WHO will be a good learning experience which she can later use in India. Universal health coverage, addressing the burden of non- communicable diseases (NCDs) or looking at access to drugs and diagnostics will be among her priorities, she says. Swaminathan is also the secretary of the Department of Health Research under the Health Ministry. “From 2009 to 2011, she also served as Coordinator of the UNICEF/UNDP/World Bank/WHO Special Programme for Research and Training in Tropical Diseases (TDR) in Geneva,” according to WHO. She has sat on several WHO and global advisory bodies and committees, including the WHO Expert Panel to Review Global Strategy and Plan of Action on Public Health, Innovation and Intellectual Property, the Strategic and Technical Advisory Group of the Global TB Department at WHO, and as Co-Chair of the Lancet Commission on TB, it said. Swaminathan received her academic training in India, the UK and the US and has published more than 250 peer-reviewed publications and book chapters.